The tallest growing of all of the gardenias is Gardenia magnifica. Reaching around 2m in good conditions this is a double flowering gardenia, late flowering but living up to its name with wonderful double waxy white flowers. Growing well in part shade to full sun depending on climate zone, the flowers appear from spring through summer, large fragrant flowers and glossy foliage. Fewer flowers than some gardenias, but bigger blooms make up for this. Excellent as a specimen plant or as a low border or hedge. We have seen these used as topiary plants as well. 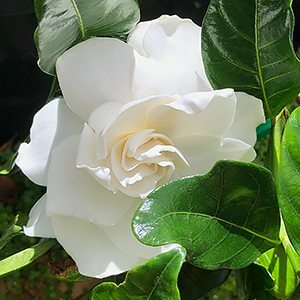 Not only is this a tall growing variety, Gardenia augusta magnifica has very large solitary waxy white perfumed flowers and lovely shiny green foliage. Gardenia magnifica grows well in warmer areas of Australia, in cooler climates try to choose a sunny protected position for best results.Used widely as a specimen in a container or pot on a sunny balcony. Also useful as a hedge or in the garden border. You can buy these plants as a standard and they look great in containers in this form. As it it takes well to pruning it can also be used as a flowering topiary plant. Gardenia magnifica certainly lives up to its name. Try an slightly acidic soil, well mulched and lots of sun. Gardenia augusta magnifica can be grown in a container or in the garden. Choose a warm sunny position. Dig a hole twice the diameter and a little deeper than the container. Prepare the soil by digging through well rotted compost and aged cow manure. Place the plant so that it will sit at the same level in the soil as it was in the container. Some compost and manure mixed with soil placed beneath the plant will allow it to be level. Backfill around the plant with the soil, compost manure mix. Fertilise each spring with a specialist gardenia fertiliser. Growth rate – Medium to fast depending on soil and climate. Faster in warmer conditions. Fragrance – Yes, highly perfumed. Soil – Humus rich with a slightly acidic. Position Full sun to part shade, to much shade may inhibit flowering. Suited to Containers – Yes G. magnifica will grow well in containers and can be pruned to size. Yellow leaves are usually caused by lack of nutrients, a specialist Gardenia Fertilizer applied as directed is usually enough to bring them back. In cooler area w suggest a liquid feed during winter months with a fish or seaweed emulsion. Sooty mould will leave a black film on the foliage, see your local nursery for a solution.